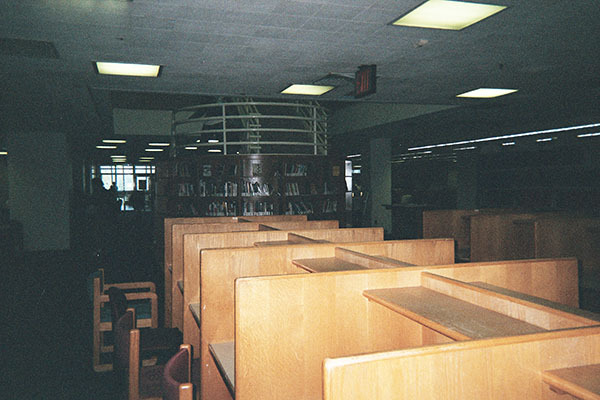 Many, many students photographed the traditional library carrel desk as a place in the library or at school where they study, and some as their favorite place to study. 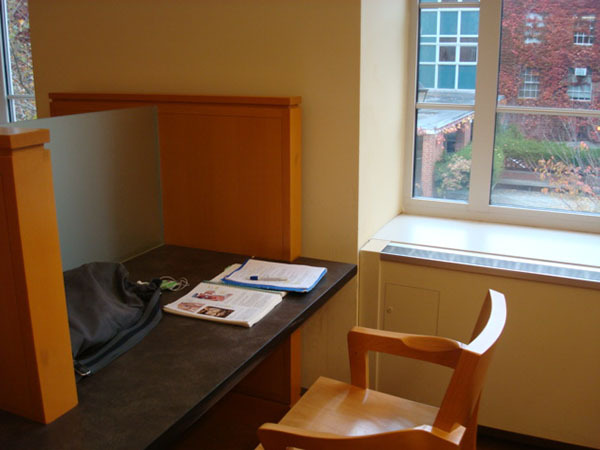 The opportunity that carrels offer for privacy seems especially valuable for commuter students in NYC who may live in small apartments with multiple other people. Yeah, it’s on the second floor. All the way inside. And, I picked this, ’cause I like sitting next to the window. Especially when it’s like sunny that day. So that the sun shines in and it’s not as gloomy. Student: I like to study there. I like the cubicles. Interviewer: You like those high walls on the cubicles. Student: Yes, ’cause nobody…it cuts off distraction. You can’t see anything and nobody can really see you, it’s all in your cubicle. Interviewer: And is the library a place that you like to study? Student: Yes, very much so. It’s not really a place that I like to “study,” so to speak, it’s a place where I learn. I think I’ve learned more in this library…or, not more…just as much in this library I’ve learned as I have overall in my classes with my professors. Student: Yeah, this is underground. And almost no one is there. And it’s REALLY quiet, like extreme. You won’t be hearing anyone’s voice outside. It’s completely silent. I love this place. This is where I study, like, every, like, couple of, at least two times a week. Interviewer: What do you like about it? You like the quiet? Student: Yeah. The quiet. And it’s like all closed out. Interviewer: You like studying at the cubbies rather than at a big, rather than at a table? Student: Yeah. When I come into these kinds of rooms I just feel like going on the internet, going on Facebook, just do random stuff. But, when I come here, it’s like, I have to do my work. I don’t know, I feel too relaxed with so much space at a desk. I don’t know, it just feels better for me. I can focus more in those kind of things. Interviewer: So this looks like this is in the library. 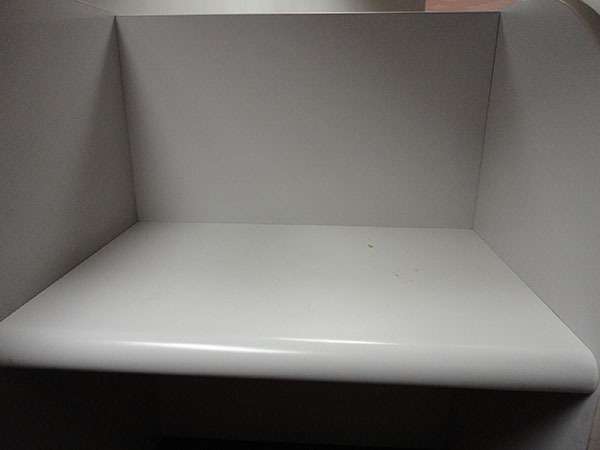 Student: Yeah, it’s one of the little cubicles to study. Interviewer: And what floor is this on? Is this downstairs? Student: Yeah, this is downstairs. I’m at the library early in the morning, it’s usually empty, so I usually don’t even have to go upstairs, so it’s kind of quiet downstairs. Interviewer: Your favorite place to study, where is this? Usually it’s those types of stuff, I study alone. 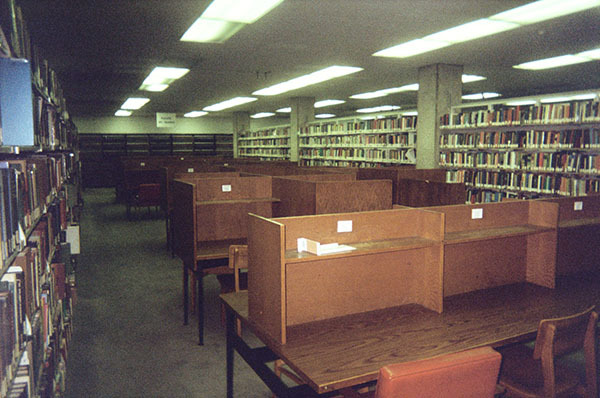 Interviewer: Right, the carrel desks? 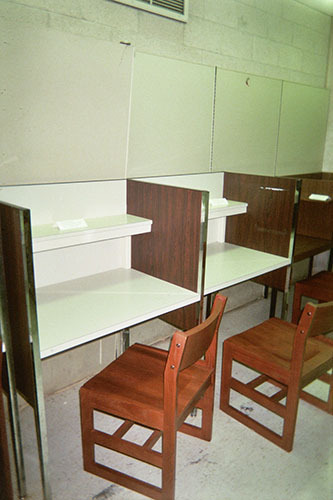 Student: Yeah, the carrel desk. ‘Cause it’s, like, uh, I have, like, some privacy which is, uh, a thing lacking at…So, I have some kinda privacy when I study in those types of things. 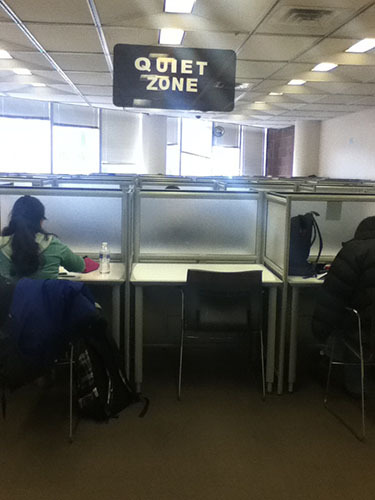 And this is the quiet zone. This is where I get most of my studying done. And this is where I like to come and just zone out.